Direct from its smash-hit run on Broadway, the international music sensation launches a national tour this fall that includes a stop at Tilles Center for one night only. The fall performance features special guest vocalist Dee Snider from Twisted Sister and the world premiere of two new musical movements not heard previously on Broadway. 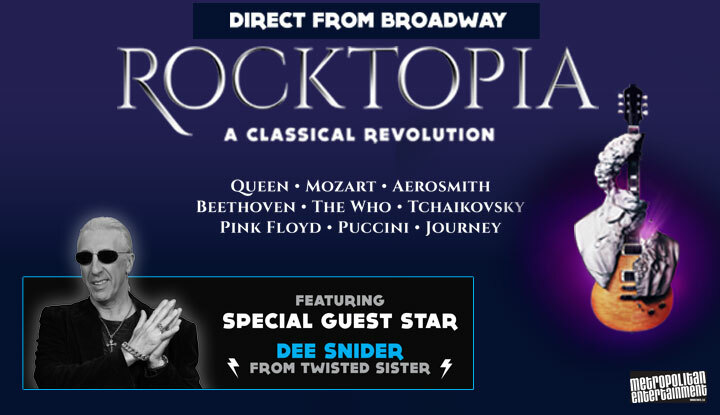 The live concert will be performed by a celebrated, diverse array of rock, Broadway, and opera vocalists: Dee Snider (Twisted Sister); Rob Evan; Chloe Lowery (Trans-Siberian Orchestra, Chris Botti, Yanni’s Voices); Tony Vincent (Broadway: American Idiot, RENT, NBC’s “The Voice”); and featuring Alyson Cambridge (The Merry Widow at the Met Opera,Madame Butterfly, La Boheme, Show Boat). The world-class musicians featured include: Grammy and Emmy Award nominated violinist Máiréad Nesbitt (Celtic Woman, Lord of the Dance) and acclaimed guitarist Tony Bruno (MD & guitar for Enrique Iglesias & Rihanna, “America’s Got Talent”).